The Kvarner Riviera‘s largest city is Rijeka which, with a population of just over 200,000 people, is also Croatia’s third largest city and its busiest port. The word rijeka actually means river in Croatian, and likewise the Italian name for the city – Fiume – also means river. In all honesty, Rijeka is a transit post and with few beaches, it is not really a place to stay for a holiday. Many people take a boat or bus and leave for other places along the coast as soon as possible! That being said, there are a number of sights in the city as well as plenty of cafes, restaurants, bars and shops. It’s a bustling place and close to other towns, resorts and islands should you wish to hop over to enjoy some seaside time. Rijeka is therefore still and interesting place to visit and even stay in. Rijeka Airport, on the island of Krk, is the city’s airport and there are flights to there from a handful of European cities, including London. See our Getting to the Kvarner Riviera page for more details on various flight options. If you do fly to Rijeka Airport, there are buses that meet each flight arrival that take you to the main bus station in downtown Rijeka. There are regular buses and trains from Zagreb to Rijeka. Bus is actually the slightly better option – because the bus travels on the motorway, some buses only take 2 hours 15 minutes. Autotrans is one of the major bus companies in Croatia and is based in Rijeka, so see their website for timetables of routes to and from the city. There are buses between Rijeka and all the main destinations in Croatia. For train timetables for both internal Croatian journeys and international ones, see the Die Bahn website. Jadrolinija run a catamaran service connecting Rijeka with Rab island and Novalja on Pag. 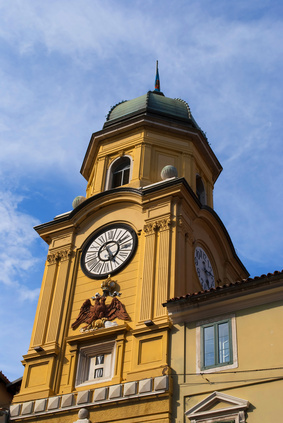 Rijeka has had a very eventful past and has been ruled by many different countries and empires over the years. 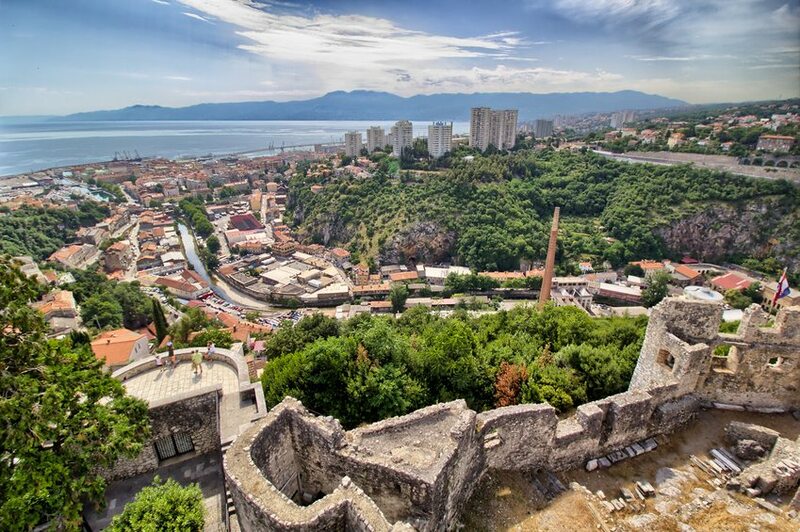 In its early history, Rijeka was an Illyrian settlement before becoming part of the Roman Empire in 2nd century BC, and given the name Tarsatica. In the middle ages it was part of the Croatian Kingdom and then part of the Habsburg Empire before it was declared a free city in 1530 and a free port in 1719. Trade with the Middle and Far East helped Rijeka grow and establish itself as a port. In 1779, Rijeka came under the control of Hungary and substantial building work was undertaken on Hungary’s international port. In the late 19th century, the first railway track was built in Croatia connecting Rijeka, through Zagreb, to Budapest and thus the importance of Rijeka grew even further. For these reasons, various industries were based in the city, including a huge ship-building yard. After the disintegration of the Austro-Hungarian Empire in 1918, an interesting event occurred in Rijeka. The great Western powers intended to declare the city a free port under international control. However, the Italian poet and writer Gabriele D’Annunzio marched into the city with his supporters and declared it a part of Italy. Rome was reluctant to accept this, so D’Annunzio declared Rijeka a city-state. Eventually in 1924, Mussolini annexed Rijeka. In 1947, the city became Croatian again, as part of Yugoslavia. The fully pedestrianised Korzo is the main street in Rijeka, with numerous shops and cafes. On the Korzo is the City Tower (Gradski toranj in Croatian) and its four clocks which has been built over a period from the 16th to 19th centuries, with its general appearance stemming from the 18th century – the clocks are from 1784. The Roman Arch, considered to be from the 4th century, has been the subject of some debate over the years. Linked to Emperor Claudius II, and also thought to be a triumphal arch or a city gate, it is now believed to have been part of a fortress. The Church of St Vitus, octangonal in shape, is from the 17th century and built on the site of an older church; St Vitus is the patron saint of the city. Within the church is a crucifix from the 13th century that, legend has it, was struck by a stone thrown by a chap called Petar Loncaric in 1296 after some back luck on the cards. The earth opened up and swallowed him whole, while the crucifix began to bleed. Ivan Zajc National Theatre was built in 1885 to the design of Austrian architects Ferdinand Fellner and Hermann Helmer. Ivan Zajc was a prolific Croatian composer and conductor (and born in Rijeka); he worked at the theatre from 1855 to 1862. Details of current performances can be found at www.hnk-zajc.hr. For something a bit more modern, why not take a look at the Peek & Poke computer museum? With over 1,000 exihibits of computer history (consoles, computers, calculators) it’s definitely worth a visit. Open on request, contact the museum in advance to arrange a visit. Peek & Poke also opened a separate Museum of Childhood – featuring toys and games from the 19th century to the present day – in 2013. See accommodation listings on our Accommodation in Rijeka page. The area code is 051. The Tourist Board is at Uzarska 14, tel: 051 315 710, fax: 051 315 720, email: tz-rijeka@ri.t-com.hr. More information can be found at the very useful Rijeka Tourist Board website and at the City of Rijeka website. See our map of Rijeka.